I am really enjoying my copics much more than I ever did with the Spectrum Noirs. Yes I sold most of the noirs to feed my new addiction "Copic Markers" but I don't regret it. I do have some noirs on hand as well as a small collection of Mepxy markers. Those are more compatible with copics than noirs as they blend more easily and they also have the brush tips (not present on my noirs). Mepxy markers are also refillable but the refills are nowhere on the market (bummer!..) 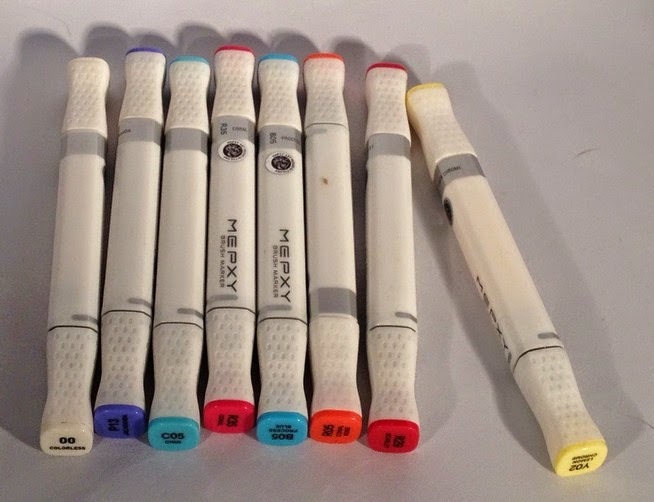 The best thing about them is the price (yes..) you can buy 3 Mepxy for the price of 1 Copic...(is that enough to make you take the plunge?). So like I was saying, I have been playing with my markers and finally "attacking" some of my forever swelling wonderful collection of digital stamps. I worked on the Blossom Boot from Anonymous Stamps. They have some cute "free" digi stamps and while you're visiting why not join them for one of their challenges on their blog or on their facebook page. I hope you will like my take on "Blossom Boot".